NUXE Prodigieux: I’m Starting Summer Early. My latest Hush order has arrived: just look at those colours! 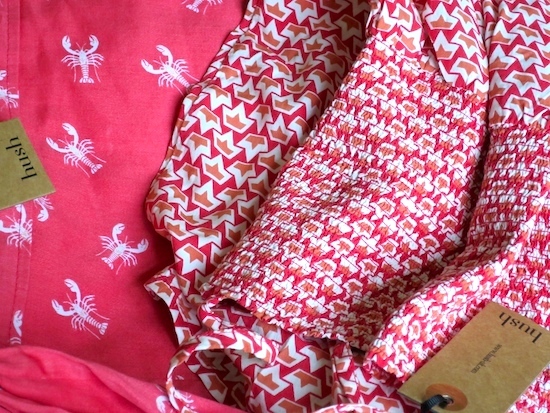 I bought a cotton printed maxi-dress, the cut and style identical to the snake-print one that I had last year, and I also purchased a snazzy pair of lobster-print pyjama bottoms. Both items I had intended to keep until the warmer months but I have to say that the jammies were so lovely and cheerful that I couldn’t resist wearing them early. I have them on now, as I type. Completely unsuitable for our current weather conditions (there has been frost on my lawn (not a euphemism) for three days running now) but I don’t care. I’m bored of rain and winter and I’m going to just start living as though it’s June. In Greece. I have set the heating thermostat to 30 degrees and rolled my yoga mat out underneath the living room radiator – there’s a bag of sand outside next door’s shed that I have my eye on, too, but I think Mr AMR might just lose his cool if I turn the lounge into a fully-fledged fake beach. Actually what set off this whole Summer Madness thing off was NUXE’s newly launched perfume, Prodigieux, which I spritzed liberally all over myself on Saturday morning and have been addicted to ever since. It smells very similar to the cult beauty oil, Huile Prodigieuse, a product that holds fond memories for me because makeup artists always used to oil up my arms and legs with it before shoots. Whenever I smell Huile Prodigieuse I get transported back to my early years as a model; lying in a hammock on some tropical beach or, as was more usual, standing in some godforsaken carpark in Hackney Wick (before it was “gentrified”) watching crack addicts and truants lobbing bricks at the photographer. Ah, the sweet memories. The oil used to give a lovely sheen to the skin, but I do have to admit to finding body oils in general a little bit of a faff, especially when I’m on holiday and I’m hot and sticky from a day at the beach. Now, with le parfum version, we get the oily, summer, beachy smell, but without the oil! Marvellous. 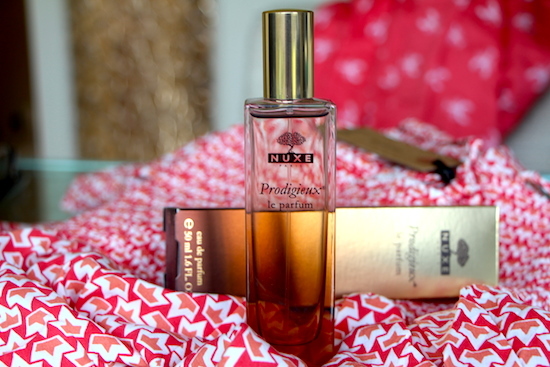 I don’t know how to describe the scent of Prodigieux or, indeed, Prodigieuse, without resorting to a cliché and so I’m going to resort to a cliché: it’s summer in a bottle. NUXE Prodigieux, le parfum, is £43 with free worldwide delivery here – you can find the range of oils, including the brilliant shimmery gold one, here. Previous Post Crilly and the Cosmetics Factory: When Imaginations Run Riot.